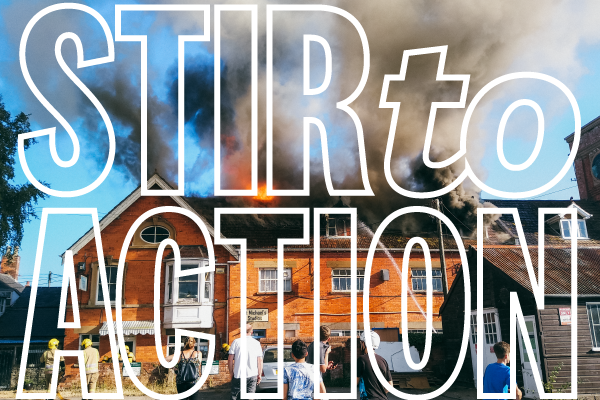 On July 7th, an accidental fire in a neighbouring studio wiped out Stir to Action's office – we lost everything. We estimate we've lost around £15,000 in magazine stock and archive, new office furniture, office computer, and paperwork. And, of course, the office! To see us through the next six months we're asking for support. We're not expecting to recover everything, but here are the basics that will help us get back on our feet! - Office Furniture: desks for our team, and equipment for workshops, evening classes, and other community events we plan to host over the next six months. We've already been offered free office space by a local organisation! - Magazine restock: we are looking to reprint 1,000 copies of the last four issues only, so we can sell them at events, conferences, and through our online shop. - Printing next issue: The most immediate challenge for our organisation is to fund and produce our next issue. Staying on our print schedule is not only important for our cash flow, it's also a symbol of our recovery and solidarity. Our October issue will be themed on the communities and co-operation that arise during and after disasters and crises, and we’ll also run a series of nationwide events around the publication. - Magazine archive recall: We’re looking to rebuild our print archive from our first issue, Spring 2013, to our 15th issue, Autumn 2016 (the remaining archive would be replenished by our restock print run). We are limiting our collection to 10 copies each for storage reasons. Please send a message on this page if you don’t mind giving up a few of your back issues!